Every day at Waukeela is a special day, but there are a few days each session where we celebrate VERY special days! On these days our activities get put on hold to dress up, play games, eat special meals and have fun. Each session has two special days and returning campers look forward to these all summer long! Some of our favorite special days are the Fourth of July (complete with a rousing wake up call of “The British are Coming), pirate day, and Medieval times. This is one of the most beloved and treasured Waukeela traditions! On the first night of camp each camper is randomly assigned to either the Green or White team. Over the entire summer both teams have opportunities to earn points for their team. Our campers have an amazing time displaying friendly competition, sportsmanship, and teamwork. By the end of the summer only one team can be selected the winner and the final Green vs. White announcement is made in front of the entire camp. At the end of the games, each team toasts each other and starts preparing for next year! 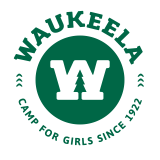 Every Saturday, Waukeela returns to its New England roots and hosts a town hall style meeting where campers can provide praise and feedback to the Waukeela staff. This council helps our camp community remain strong and provides fantastic leadership opportunities for each of our campers. Every Sunday, our campers gather around their alley’s campfire for our Council Fire. This peaceful and special time allows us all to reflect on the friendship, community and traditions of Waukeela. Each week at camp has ended with a Council Fire for more than 90 years and it is one the most beloved moments of each week at Waukeela.